4 micro heroes, mega battles! 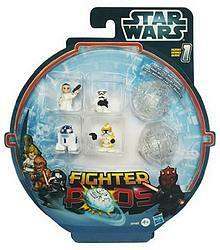 Iconic Star Wars characters get a collectible new gaming twist with this awesome FIGHTER PODS pack! Use your pods to knock down as many figures as possible. Spin, launch or roll your pods into battle! When you need extra "power" to prevail, connect your pods together, or place your figures on top or inside of them! Get your "intergalactic" battle game on with the 4 figures in the 4-Figure Pack! Get your own force of Star Wars figures and the pods to send them on adventures all over! Spin, launch and roll your way to endless intergalactic excitement. 3 ways to play and more! Miniature STAR WARS figures and pods for fun battling play!